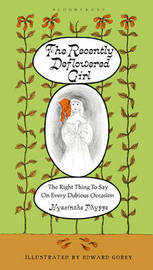 Long out of print, "The Recently Deflowered Girl" is a tongue-in-cheek guide providing advice for that trickiest of situations. 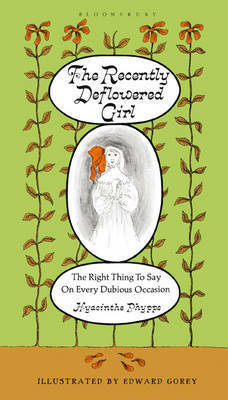 In the voice of Miss Hyachinthe Phypps, Mel Juffe's hilarious yet demure counsel is delightfully accompanied by Edward Gorey's ink and watercolor illustrations. A truly prodigious and original artist, Edward St. John Gorey (1925-2000), gave to the world over one hundred works, including The Gashlycrumb Tinies, The Doubtful Guest and The Doubtful Guest; prize-winning set and costume designs for innumerable theatre productions from Cape Cod to Broadway; a remarkable number of illustrations in publications such as the New Yorker and the New York Times. Gorey's masterful pen and ink illustrations and his ironic, offbeat humour have brought him critical acclaim and an avid following throughout the world.